What Does Your Driver Turnover Tell You? Randall-Reilly / Driver Recruiting / What Can You Learn from Driver Turnover? In the end driver recruiting is a numbers game. You need to find the right drivers to fill your empty trucks and get them on the road. The more trucks you have sitting idle, the more money you stand to lose. On the face of it, it wouldn’t seem like getting a driver is that difficult a task. After all truck driving as an occupation continually ranks as one of the most popular jobs throughout the United States. In fact, in all but a handful of states truck driving ranked in the top five of the most popular jobs from 2015-2018. But we all know that getting the drivers you need is actually a difficult task. Why? Every year we increase the amount of freight shipped and thereby increase the burden on fleets like yours to move it all, and as a result the demand for drivers is constantly increasing. And as popular as truck driving is in the U.S., we’re having trouble keeping up with that growing demand. So, what can you possibly do? We here at Randall-Reilly are big fans of data. We try to help everyone we work with dig deeper and go beyond the superficial stuff and really drill down to find out exactly what they need. In the case of driver recruiting that means using every piece of available data to figure out not only how to reach the drivers you want, but what kind of drivers you need to begin with. What Kind of Drivers Do You Need? Stay Metrics recently did some research and released some interesting findings. Taking these results into account and using them to help plan how you approach recruiting could help you turn the corner and get the drivers you need. I know that’s a lot of numbers to throw at you, but what that chart is telling us is that out of the 89 carriers Stay Metrics tracked, 60% of all drivers hired in January of 2018 did not stay with the company for a full year. So what right? We all know that turnover is a big part of the driver recruiting equation. True, but I’m not so much interested in the drivers that didn’t last a year, rather I want to dig deeper and see about that other 40%. Those are the drivers that matter here. We all know there will be driver turnover. That’s pretty much baked into the cake at this point, but anything we can do to cut that turnover would be great right? That’s exactly why that 40%, that segment of drivers who DID stay with fleets for a year matter. If you’re anything like those 89 carriers who participated in the survey your numbers are probably somewhere in the same ballpark. Meaning out of all the drivers you hire in January of this year only a fraction of them will still be driving for you by year’s end. There is no magic bullet to this and no answer or tactic can 100% eliminate driver turnover. However, you can do your best to reduce turnover and increase retention by doing one simple thing. Look to the drivers in your fleet who have stayed with you. If a driver stays with you for a year or more there has to be a reason. Especially in this highly competitive market for drivers. When it comes to that segment of driver you’re doing something right. 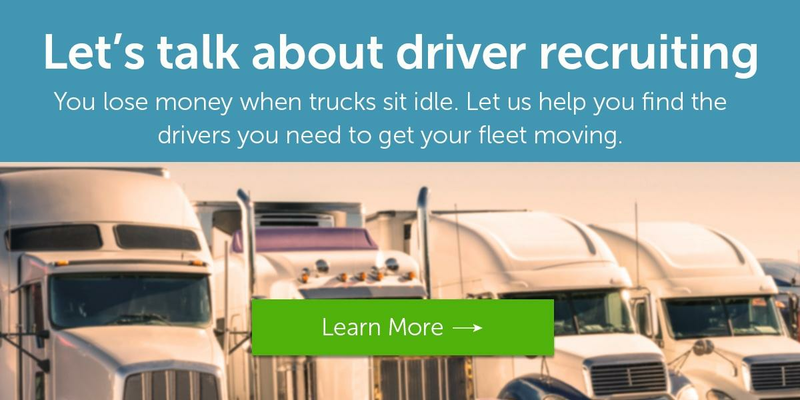 You just need to find out which drivers are most likely to stay with your fleet and pursue more of those drivers to hopefully increase your driver retention. Simple right? Start by looking at your fleet make up. Is there a driver trait that drivers who tends to hang around share? What are the commonalities? For example, your fleet may do things a bit differently and have a company culture that seems to resonate with younger drivers. Or perhaps it’s the opposite and the veteran drivers with decades of experience that seem to work out best for you. It may even be something as simple as making sure the drivers that live closest to your major hubs stay longer so you may need to focus more on your geographic targeting in your recruiting. Whatever that common theme is you need to find it and target more drivers that share that characteristic. There are always going to be some factors that cause drivers to jump ship that you simply can’t change. Higher sign-on bonuses or pay that you can’t match will likely always trump what you have to offer. But with the help of data you can try to increase your chances of landing drivers you can retain with effective targeting. With over two million drivers in our tagged audience, we can help you zero-in on high value prospects that match the criteria you’re after. Do you tend to have a high retention rate with team drivers? Then try a campaign specifically targeted towards team drivers. Using Randall-Reilly’s driver data you can find the exact right drivers for your fleet. What’s even better is not only can you target the right drivers, whether that be based on age, experience, a specific driver type, certification status, or even geographical location, but you can target and reach out to them on various platforms online. If you need help becoming more targeted or aren’t sure exactly how to get started online let us know. Randall-Reilly’s team can help get you going on Facebook, Google Search, and other platforms you want to target. Get started today and take stock of your current drivers. Which ones have been with you longest? What do they have in common? It could be the first step to increasing your retention and improving your driver recruiting.